Delectable ice cream made with luscious summer strawberries and indulgent dark chocolate. 1. 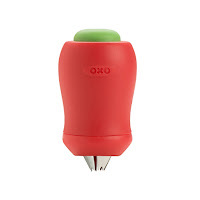 Remove the stalk from the strawberries using the strawberry huller and chop the strawberries into small pieces2. Put the strawberries in a heavy bottomed pan and add the sugar. 3. Cook the strawberries on a medium heat until all the sugar has melted and the strawberries are softened but still holding shape.4. 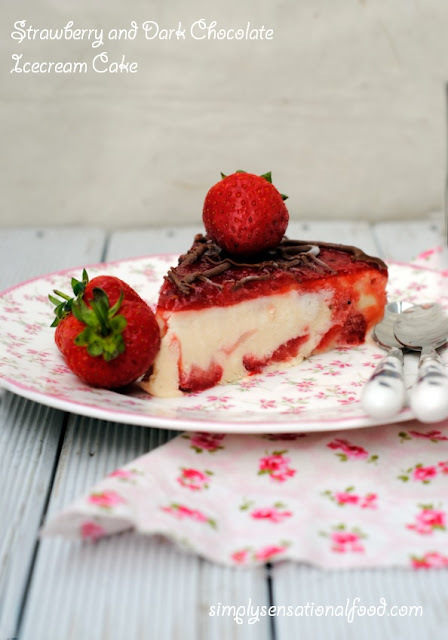 Remove strawberry compote from the heat and leave aside to cool.5.In a stand mixer add the double cream and icing sugar and vanilla essence and whip the cream until stiff peaks form.6.Gently fold the custard into the cream mixture. Once the custard is all folded in, stir in half the strawberry compote, reserve the remaining compote for the topping.7.Line a loose bottom 9 inch springform cake tin with cling film and pour the ice cream mixture into it.8. Freeze the ice cream for 2 hours after which take the tin out of the freezer and pour on top of the ice cream the remaining strawberry compote.9.Return the ice cream to the freezer for another hour.10. Break the chocolate into small pieces and place it in a microwave proof bowl, Heat the chocolate at 30 second intervals until its all melted, Keep stirring in between.10. Once chocolate is all melted take it out of the microwave and leave it to cool slightly. 11. Fill a piping bag with the melted chocolate. Take the cake out of the freezer and pipe chocolate lines all over the top of it.12 Return icecream cake back to freezer for another 3 hours or over night.13. To serve remove the ice cream cake from the cake tin by opening the spring form tin and gently removing the cling film.14. Place the cake on a serving dish and leave out for 3-4 minutes. Cut into slices and serve garnished with remaining strawberries. Making this ice cream cake is simple, I think the only difficult thing is is hulling the strawberries which I find time consuming. 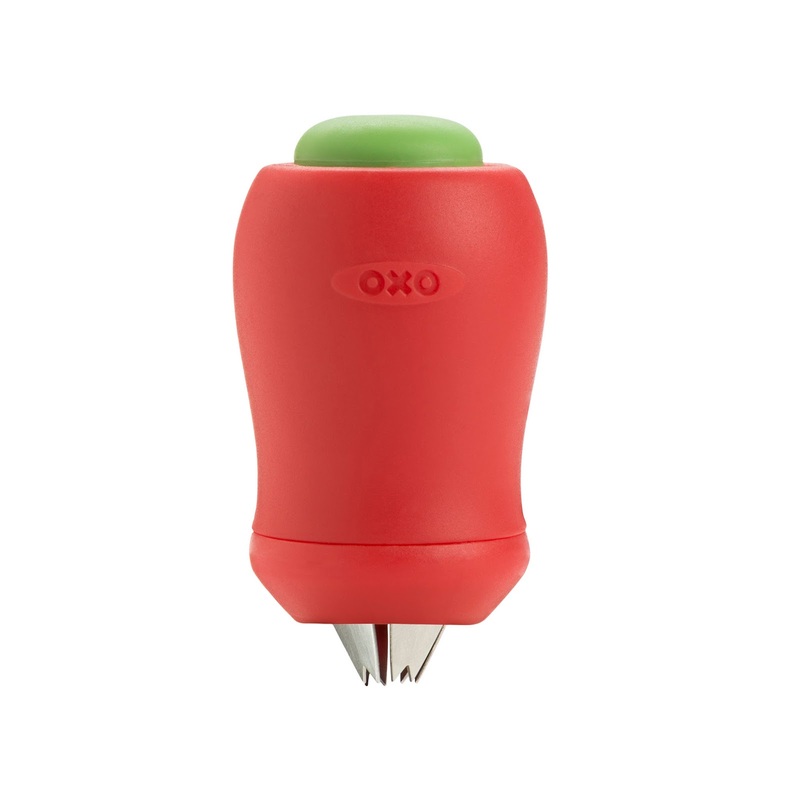 However OXO have come to my rescue by sending some products that helped me by making my task easy in the kitchen. Of course you could make this ice cream in a tub and scoop it into ice cream cones using the OXO Trigger ice cream scoop . 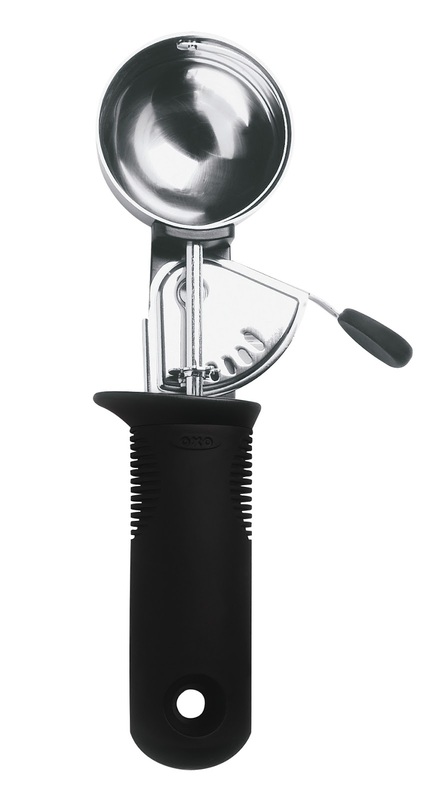 The scoop makes round balls of ice cream that can be easily transferred to a cone using a simple press leaver avoiding any mess. The stainless steel ice cream scoop is easy to wash afterwards too. If you want to enter a giveaway to win a strawberry huller and ice cream scoop do click on the link below to take you to the competition entry page. The cake looks awesome . Loved the presentation too. Wow, a whole cake of ice cream Nayna. What a super idea and it looks totally lush. I have been seeing loads of ice cream cakes around, but I have still never tried one. I bet the strawberry and dark chocolate combo is really good though. Ooo how decadent does that look? I've never had an ice cream cake, can't think why! That must change soon! Ooh this sounds and looks delicious I love strawberries and with dark chocolate yummy. I was only thinking to myself the other day I need to try an ice cream cake so may have to give this one a go. That looks out of this world. I really need to make this!! 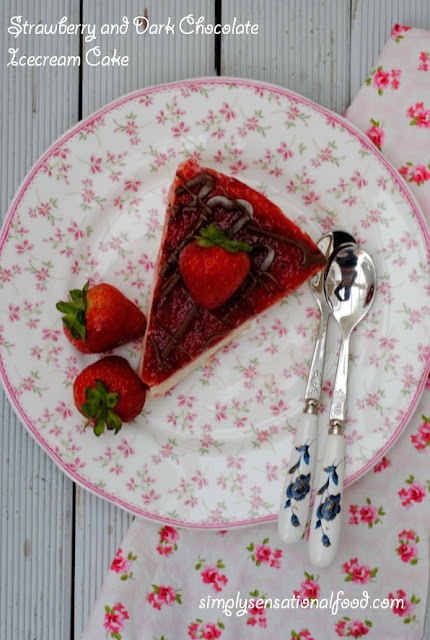 I love this idea, as an unusual twist on the normal strawberries and cream combo! I absolutely love ice cream cake, I definitely need to try this!!! If it tastes half as good as it looks, it will be divine. OMG, my mouth is watering. I have never made an icecream cake before, but I think you have just inspired me. This looks and sounds absolutely delicious! Save a slice for me! 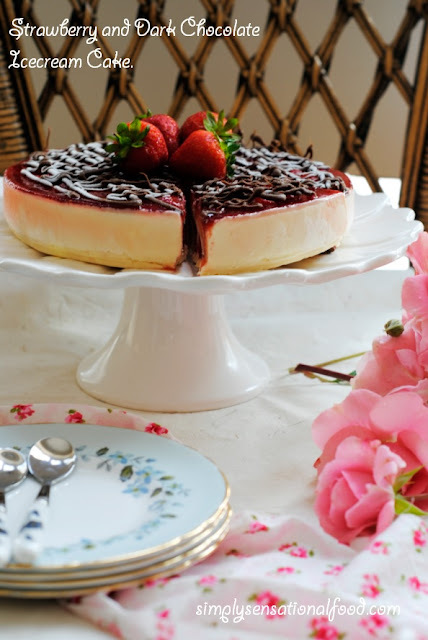 Strawberries are always a favorite at my house, and this Strawberry and Dark Chocolate Ice Cream Cake is just lovely! Enjoy July, Pimm's, strawberries, and Wimbledon! Ice cream cakes were a favourite of mine as a child, and I'm always looking for ways to eat them as an adult! I think you've definitely given me a way I can justify eating them and serving them to guests! Oh my gosh. Strawberries and dark chocolate are a marriage made in heaven! We moved a couple of months ago and gave our liquor stash to my brother-in-law. Unfortunately that included our Pimms No 1 and haven't been able to find it here yet! What a delicious sounding cake. Looks like the huller came in very handy. This sounds so good! My favourite flavours in an ice cream cake - yum! What a great idea for wimbledon! I have never tried to make ice cream cake before but given that my husband loves ice cream and i love cake it sounds like I need to! I'm allergic to strawberries. BUT, maybe raspberry and dark chocolate ice cream cake would work? Perfect for this time of year. I have stacks of strawberries ripening in the garden at the moment. Yum, this look so good! I made an ice cream cake a few years ago for a birthday party - it went down well!